Twitter, Facebook, YouTube - in the tech arena, some of the best tried-and-true web sites are getting old-and-tired. You can update your status, play Farmville, and post photos from that crazy office party, but are there any sites that actually offer something new and innovative? Yes, and here are eight of the best that you may have never heard of. Postabon is a deal sharing site that works with iPhone and Android devices, but the truly innovative feature is that it uses location awareness and AI. For example, once you connect, the site figures out where you are based on your IP address and then shows you any store discounts in your area. Then, once you register and start browsing for deals, the site uses Common Lisp and a Hunchentootserver to track your searches and preferences (say, if you normally want to see deals on books and DVDs). Google News gets a lot of attention as a great good news aggregator. TopicFire may not have the depth of content, but is better at weeding out old and irrelevant news. The site also has some cool features for Facebook integration, news alerts using PubSubHubbub and rssCloud, and an automatic way to list only top-ranked stories. People keep finding new ways to use Twitter, and the latest is called Bugtwits, a site that aggregates any and all bugs for web sites and software. One of the primary uses for the site is to search for bugs you are experiencing - for example, you can troubleshoot why you can't login to Facebook during heavy traffic periods. When you find a bug, you can tweet back to that user for more info. ShapeCollage is not necessarily practical, but does do something brand new. Without even having to register, you can enter a URL that contains photos or direct links to photos (such as those on your Flickr page) and then create a collage out of the images. Then, you can share the finished collage on Facebook or by e-mail as an embedded link. ShapeCollage also offers free desktop software. KartMe is another content sharing site - once you find a cool product, restaurant, photo, or web site, you can share the content with other users. It's like Google Bookmarks but goes a step further by "karting" the actual media files. KartMe.com runs on Drupal, a module based system for adding new features, such as password protection for karted items. One recent trend on the web - with sites like Joomla and through domain hosts such as GoDaddy - is to offer a full suite of tools for creating a robust site. Yola goes a step further by actually making it easy and by providing templates that are not the typical blogger fare or something that anyone could cook up in Dreamweaver. The site is built on Ajax and supports drag and drop editing. Most important for businesses is easy integration with other services, such as PayPal and YouTube. There are also 60,000 widgets you can add, although we don't recommend using them all. One issue with YouTube is that you really need video editing skills (and desktop software) to make a great video. Pixorial is one of the only sites that not only hosts your video, but has a full set of online editing tools - most built on Ajax and Flash - that allow you to edit the video as well. The site lets you share the finished videos by email and you can even make a final DVD to send to friends and family. Shopping is a shared experience - at least in the real world, and assuming said shopping isn't for a frozen meal for one. 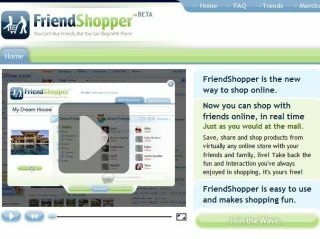 FriendShopper is a social shopping site - you just drag and drop a bookmarklet to your browser, add friends, and then add shopping items with a group of friends. You can add new sites that everyone can see and - in real-time - select items you want to buy and decide which ones everyone agrees on (say, for apartment roommates or a weird cult).